Middle Grade Mafioso: Goodbye 2018... Hello New Year! Some years are like that! I found it helpful to concentrate on one thing- in my case, reading and writing reviews. Kept me going a bit longer. 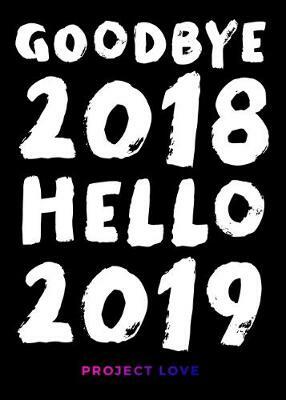 Here's to a better 2019! Congrats on NaNoWriMo. I've never tried it, but I'm not dead yet. Happy New Year to you as well. Rosi, you crack me up! How awesome you completed NaNoWrite. I'm trying to carve more writing time out too. Hope you blog more this year. It's a great way for us all to stay connected. Congratulations on finishing NaNoWriMo. I have never managed to do that but maybe one day... I'm looking forward to your reviews in 2019! What?? Project Mayhem shut its doors?? First I'm hearing of it (just like not knowing Erin Entrada Kelly won the Newbery until this past November!). What a shame. Sometimes I feel like I'll never catch up to the year and a third I missed. Congrats on "winning" NaNoWriMo! I never tried it, but my older son has completed it twice. He admitted when he was getting behind he'd sometimes write "blah blah blah blah" to gain a few words, or "Something exciting needs to go here". You do what you can, I guess. I admire you for it. And I'll be happy to see you around here more.